Update: If you are interested in participating in this workshop, please fill out the info form by January 12th and read through the syllabus before the first day of class. And if this workshop is of interest, you may also want to join Ezra Glenn’s IAP Urban Planning Film Series: Imagination and Place / Spotlight on the 1960s. 2017 has rattled our collective understanding of ‘normal’. Reality, facts, science, truth suddenly have been called into question, with startling effects on public discourse. We aim to move into 2018 more prepared to tackle these new challenges head on: by building tools and space that are able to make sense of, and pose alternatives to, this new world we find ourselves in. We believe that core to reckoning with this moment is the need to unleash our imaginations; to pose resonant and resilient alternatives to the alt-right future that is emerging before us. We want to build new worlds in collaboration with one another and explore ways to speak them into being. We are kicking off 2018 with a 3 day IAP workshop to link together the critical everyday work already happening at MIT with the brilliance of speculative fiction. Addressing the challenges of global life in the 21st century will require a different level of imaginative thinking. 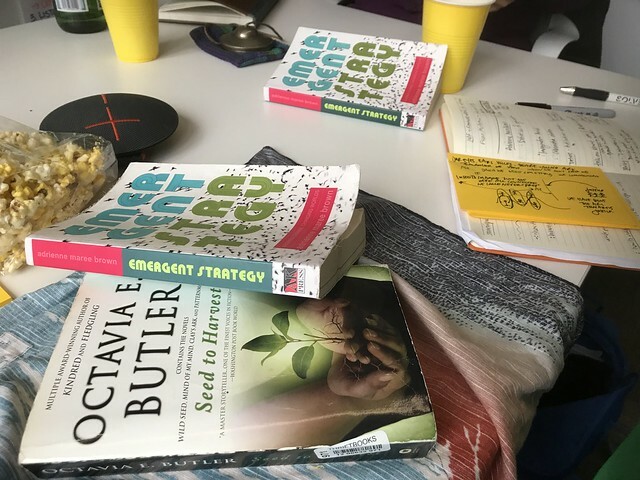 We (Grant & Lawrence) are inspired by all things visionary fiction including Octavia’s Brood, Emergent Strategy, and adrienne maree brown’s Detroit Sci-Fi Generator, and have been running some of our own experiments via the Alternative Futures writing collective and our own iteration of the Collaborative Sci-Fi Generator. It’s 2018 and something isn’t right. Or maybe more accurately, almost everything is wrong. The joint powers of imagination and fear have established a seemingly untouchable demagogue as the elected leader of the world’s most powerful empire. He carries out the wishes of the elite while destroying the dreams, realities, and futures of everyone and everything else, including the planet herself. Standard tactics are proving ineffective. Fact-checking has been rendered useless. Reason, unreasonable. Imagination, myth-making, and stories reign (see alternative facts). The future of America, and perhaps the world, is in the hands of the best storytellers. The Resistance is evolving to meet the challenge. How do we build past, even through fear, to something more powerful? To… radical hope? We are one faction of many fighting for the future; we are writers, thinkers, and artists using our powers to fight imagination with imagination. In this 3-day workshop in January, 2018 we will: learn from the rich ancestry of speculative fiction, practice collaborative ideation and world-building, and create stories and art that may unleash new futures to topple the hegemonic order. Come, join our schemes. Official IAP course listing here. I’d like to participate if I’m around then and have time. I am a SPURS research fellow, looking at the intersection between diabetes and cities.